Corian and Silestone are often mentioned in the same breath when discussing kitchen countertop materials as if they were just different brands of the same type of material. How do these two popular countertop surfaces compare? Corian and Silestone are vastly different; they do not even belong in the same category. While both are quality products, Corian falls in the category of ​solid surface materials while Silestone belongs in the engineered stone (i.e., "quartz") category. Solid surface means that the product has a high amount of resins; quartz means that the product has about five times fewer resins, making it the more stone-like material of the two. Can one product be considered better than the other? From a resale standpoint, quartz countertops currently rate higher among home buyers than solid surfaces. Solid surfaces are generally priced lower than quartz countertops. Composition: What Are They Made Of? One area of concern among homeowners is whether the product is deemed "natural" or "plastic." Of the two, Corian would be the more "plastic" product, but not by much. Based on technical data, Silestone has roughly 28% more minerals than Corian. Other than the idea that one—Corian​—has more polymers than the other, Silestone's greater mineral content does not matter much in terms of performance and appearance. Corian - Made of about 33% acrylic resin (PolyMethyl MethAcrylate) and about 66% natural minerals chiefly derived from bauxite. Bauxite is the same ore from which aluminum is extracted. Silestone - 94% natural quartz, with the remainder devoted to binding resins. Silestone is sometimes erroneously referred to as granite. It is not. 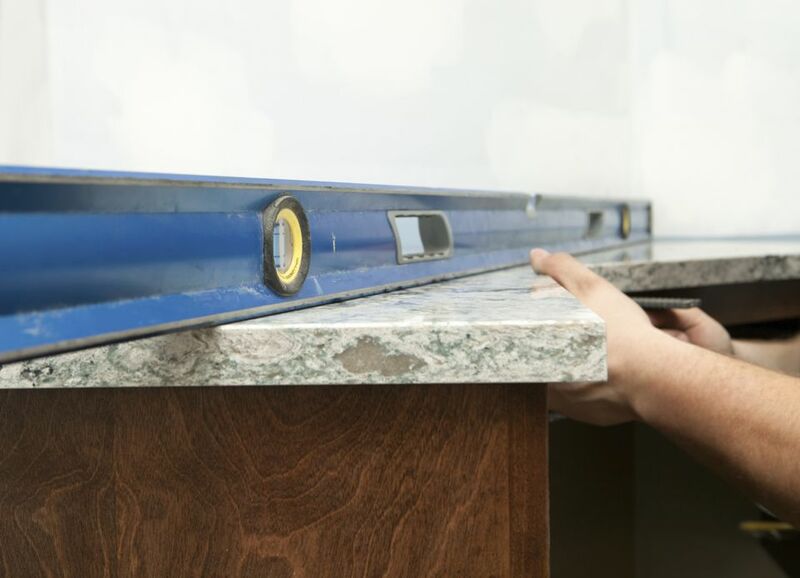 Granite countertops are quarried straight from the earth and cut into slabs. Silestone is an aggregate. Porosity and Stain Resistance: How Permeable Are They? Corian - Corian demonstrates low porosity, absorbing 0.1–0.7% of its weight as defined by DIN ISO 4586 T7 standards. Corian resists stains from CLASS I reagents, which are things like ketchup, blood, olive oil, tomato sauce, coffee (by contrast CLASS II reagents are things like drain cleaners and paint removers and these substances should not come into contact with Corian. Silestone - Silestone states that one reason for choosing quartz (crystallized silicon dioxide) as the primary material is because it is extremely hard and resists acids. Like Corian, Silestone resists staining from the CLASS I reagents, and more. Mold, Bacteria, Fungi: Do They Support Microbial Growth or Not? Both products do an admirable job of preventing the growth of molds and bacteria, without having to order a special "premium" coating. Corian - Corian does not support microbial growth. No special coating is required; it is part of the standard features of Corian. Silestone - Silestone has a bacteriostatic formula "based on the use of latest generation silver ions," according to the Cosentino website. Warranty: How Long Does the Company Stand Behind the Product? Corian - 10-year limited warranty. Silestone - 15-year limited warranty. Number of Colors: What Are Your Choice? Likely, you will find enough colors from either manufacturer to satisfy your style needs, since both are viable, popular product lines. Silestone has pared down its palette of colors in the last few years, while Corian has added about seven into the mix. Claim to Fame: Why Are They Significant? Corian - The world's first solid human-made surface developed by DuPont in the 1960s. DuPont's patent is the one from which all other solid surface materials are derived. Silestone - Silestone is produced by Cosentino, which developed the product in 1990 as a malleable stone surface for those who do not want to deal with the problems of natural slab stone. Luster and Depth: What&apos;s Their Appearance? Corian - Duller appearance, but looks great if shiny is not the look that you want. Corian does not have a deep look, though many of its colors do seek to replicate stone. Silestone - Because it is quartz, some varieties of Silestone can be quite lustrous. Because of the embedded minerals, Silestone can look very deep and have a three-dimensional appearance much like (but not perfectly equal to) natural stone. Radon: Do They Have Radioactive Gas? Granite is known to emit radon, a type of radioactive gas tied to cancer. Among Corian and Silestone, radon is either not present or in such negligible quantities that it does not matter. Corian - None. Radon has never been found in Corian. Silestone - Since quartz comes from the earth, some radon gas may be present. But the Cosentino Corporation, makers of Silestone, say that Silestone "has been tested and found to be low or free of radon gas."